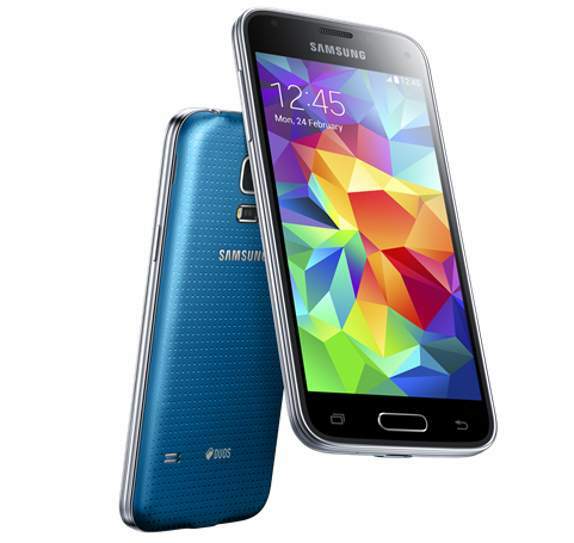 Samsung has finally launched the mini version of S5 – Samsung Galaxy S5 mini Duos. The new S5 mini SM-G800 is priced at RS 26499 in India. The Galaxy S5 mini Duos SM-G800 has 4.5 inch Super AMOLED display with 1280 x720 pixels resolution and draws the strength from 1.4GHz quad core Snapdragon 400 MSM8228 processor. It runs on Android 4.4 Kit-Kat operating system. It supports DUAL SIM and houses 2100 mAh battery. It would compete with Samsung Galaxy S4, Gionee Elife E7, Xiaomi Mi3 and Micromax Canvas Knight A350. The Galaxy S5 mini packs with 8-megapixel rear camera with LED flash and a 2.1MP front shooter. It has IP67 rating for Dust and water Resistance. It is 9.1mm thick and weighs 120 grams. There is 1.5GB RAM under the hood. It also features infrared LED for smartTV remote, Heart rate sensor and S health. It has 16GB of internal storage and further you can expand it up to 64GB via micro SD card. It is powered by 2100mAh battery. It offers 3G HSPA+, dual Band Wi-Fi 802.11 a/b/g/n HT40, Bluetooth v4.0 Le,GPS and NFC. The S5 mini is also known as SM-G800H in the USA and SM-G800F for Europe. The Samsung Galaxy S5 mini Duos will be available in Black, White, Blue and Gold colors. You can buy it online exclusively from Flipkart.